Thank you for visiting our online store. As a family based brand we value your support and shared intrest in premium craft boutique wines, and we will always honor our commitment of quality over quantity. If you have any questions about any of our wines or products we would love to hear from you! Thank you for your support as we continue to develop our program. Cheers! The infamous back label story of Franco continues on this limited run Proprietary Red Wine. Less than 20 cases left! This beautiful Essere Franco wooden box comes with 16 custom, handmade cigars and a bottle of our luxurious 2010 Essere Franco Proprietary Red Blend. Makes a great corporate gift or keepsake for that special someone! 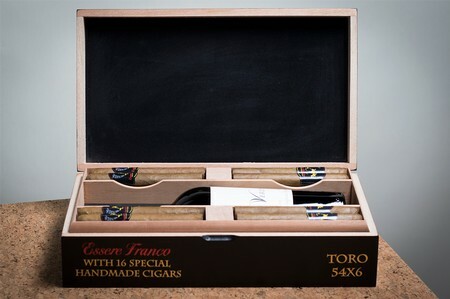 This beautiful Essere Franco wooden box comes with 16 custom, handmade cigars and room for one bottle of your favorite wine. Makes a great corporate gift or keepsake for that special someone! *Bottle of wine is not included and must be purchased separately.